Forty two years after the distinctive opening guitar riff of one of Australia’s best loved rock anthems detonated across Australian radio, this rarely seen experimental colourised version of Daddy Cool’s iconic promotional film clip for Eagle Rock has recently been found and restored by the NFSA. Originally shot on 16mm black and white film in 1971 by 23-year-old Melbourne filmmaker Chris Lofven, the newly discovered version features a 37 second section using colour filters printed onto colour film stock. The best track from one of the best albums – ever. I would say that this version of the Eagle Rock clip originated at the ABC. During 1975 – the first year of colour TV in Australia – Countdown featured a segment called the Countdown Flashback. Old black and white clips were shown, most of them altered with colour filters such as in this clip. 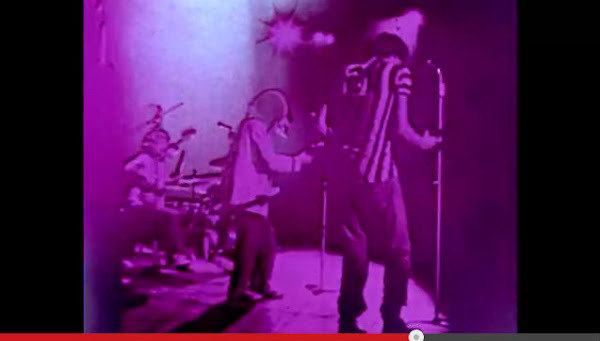 I vaguely remember the Eagle Rock clip being shown featuring this colour effect. 😀 Bloody brilliant! Thanks, Film and Sound Archive! Hell I get melancholy enough just watching Simon & Garfunkel in the park, and that came out 30 years ago. And that clip would include one of those dudes playing with Darryl Braithwaite last week – the dudes that Barcham doesn’t know! And btw, I went to that show because I scored a free ticket. Ross Wilson and Joe Camilleri are still awesome, but Joe has a beer gut and it was drooping out below his shirt when he left stage after his set. Not a good look! The audience was predominantly boomers, naturally. To give it all a bit of cred, I can report that Jo Jo Zep and the Falcons were the first pub band I ever saw – Arkaba Hotel in Adelaide, I reckon in 1974. And this clip is such a fun look at the 70’s.